As those who know me well are already fully aware and I would guess the rest of you are starting to realize, I’m a gin fanatic. Imagine, if you will, how excited I was to find out that there was a local distillery producing my favorite spirit! A coworker brought in a copy of an article that ran in our local paper about Roundhouse Spirits a small operation in Longmont, CO run by Alex Nelson. The article presents quite an interesting story about how Alex uses neutral grain (corn) spirits brought in from KY as the base of his gin. He then infuses the proto-gin with botanicals including juniper, coriander, citrus peel, star anise, angelica and orris root. Those are all the classics though, nothing particularly earth shattering there. Alex then steps it up a notch with his own blend of sencha green tea, lavender, hibiscus and chamomile. Now we’re talking interesting. Top it off with the fact that the gin is made in supremely small batches and all bottled by hand. This was a gin I just had to try. 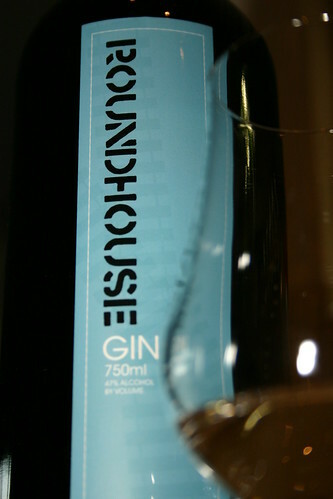 The first thing you notice about the nose of this gin is the juniper, which is a big plus for me. A lot of gins these days seem to be downplaying the juniper in favor of other scents/flavors, namely citrus. While I enjoy a citrus forward gin a great deal I have a greater appreciation for a juniper forward gin that remains balanced, which Roundhouse certainly does. The next note you’ll get in subsequent sniffs are the herbal notes of the green tea and chamomile. Once you take your first sip you’ll note a pleasantly intense flavor. This gin is certainly not one to foist upon a gin novice. Moving past the initial flavor burst you’ll get hints of the star anise and coriander coming out. Finally the green tea and chamomile remain on the finish and linger for quite some time. This gin is big and bold and I’ve found it works well all by itself in a Dry Martini (wouldn’t want the vermouth’s flavors stomping all over the gin) and also plays very well in a Corpse Reviver #2. I think it would also work very well in a Tom Collins but I have yet to give that a try. If you’re a gin fan and can find a bottle of Roundhouse give it try. You will most certainly not be disappointed. In that case, I think we’re all lucky that the Cocktail Hacker liquor cabinet has plenty of other choices as well. I recently travelled to Denver and selected Roundhouse Gin as my local souvenir. I was a bit surprised when I tasted it and found an overabundance of anise. I did not notice the juniper as described above (for a big juniper hit try the Junipero from San Francisco). Perhaps this is due to this particular small batch presentation, but I found it distracting from the overall taste. I certainly cannot recommend it at this time. Has anyone else experienced this anise front too? Could I just have received a unique batch? I have another Colorado gin – Leopold’s that is just great – martini, sipping straight, all good. My next trip has Jackalope as the souvenir target. Comments? ?